If you are visually impaired and need help with this website please call 1-877-688-7474. Motivation sparks in the mind, ignites in the heart, and manifests through action. Don’t waste another moment allowing excuses to impede your progress. Let THERMONADE™ oxidize the spark of motivation in your mind, burn away excuses in your heart, and erupt confidence, incinerating all doubt. 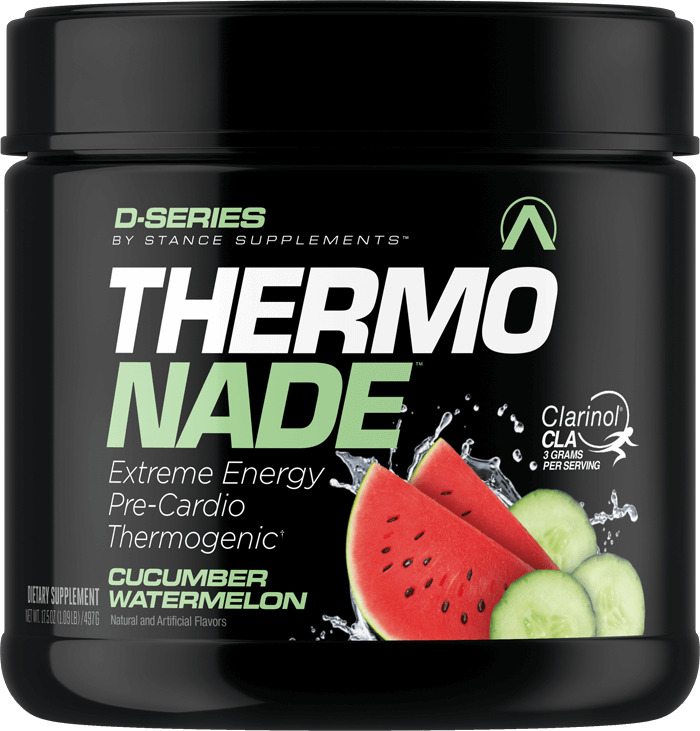 Whether it’s pre-cardio or pre-training, allow THERMONADE™ to be the catalyst to your progress and a better you! See what all the hype is about and try THERMONADE™ 30 minutes before your next workout! 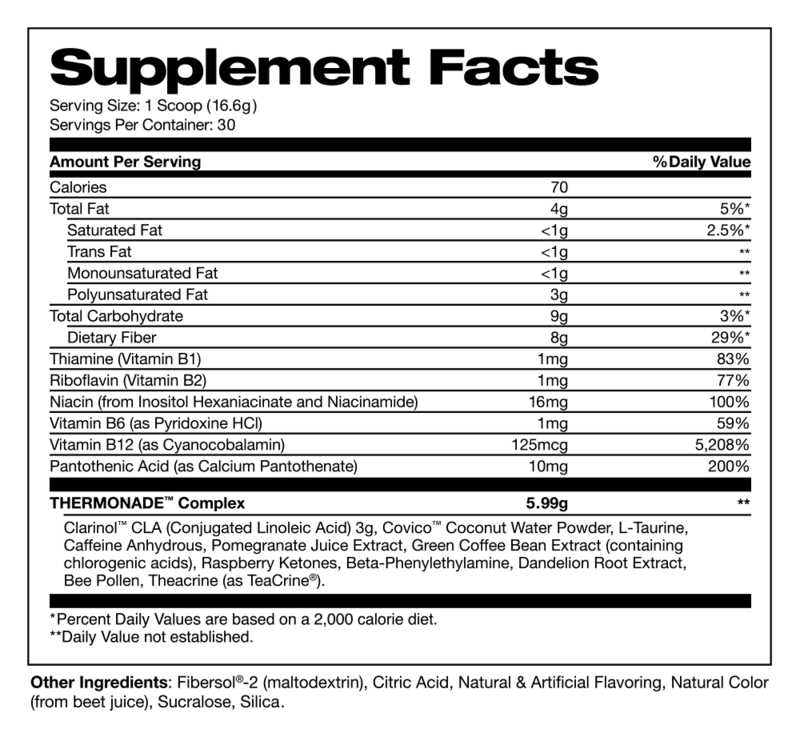 SUGGESTED USE: As a dietary supplement, mix 1 scoop with 8–12 ounces of water. WARNING: Contains 300mg of caffeine per serving. This product is only intended for healthy adults, 18 years of age or older. Keep out of reach of children. Please consult your physician before taking if you have any pre-existing medical conditions or are taking any medication. Do not use if you are pregnant or nursing. Do not use if you are sensitive to caffeine or other stimulants. Discontinue use and consult your healthcare professional if you experience any adverse reaction to this product. Do not use if safety seal is broken or missing. Store in a cool, dry place. ALLERGY INFORMATION: Contains tree nuts (from coconut). Manufactured in a facility that processes milk, eggs, shellfish, tree nuts, peanuts, wheat and soy. † These statements have not been evaluated by the Food and Drug Administration. ALWAYS CONSULT YOUR PHYSICIAN BEFORE USING ANY DIETARY SUPPLEMENT. *Low Price Guarantee at participating locations. See store for details. Professional Web Site Design - Trinet Internet Solutions, Inc.